Beam Me to Mars (hashtag #BeamMe2Mars) celebrates the 50th anniversary of the start of humankind’s exploration of Mars with the launch of NASA’s Mariner 4 — the first successful Mars mission — on November 28th, 1964. Beam Messages can be as simple as a name, or can be more elaborate, including text and even images. Anyone can send messages to Mars, and people can send as many as they want, there is no limit. Pricing begins at $5. To be included in the transmission, messages and pictures must be submitted to Uwingu’s web site at www.uwingu.com by 5 November 2014. 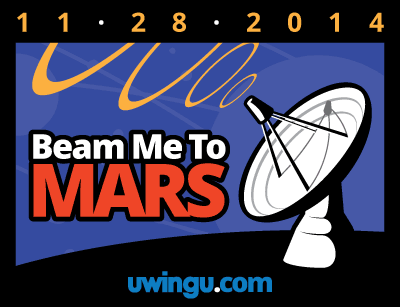 Uwingu’s Beam Me transmission will be sent on November 28th. All messages will be sent at a rate of 1 million bits per second to Mars by Uwingu’s Beam Me transmission partner, space communications company Universal Space Network. Mariner 4 took almost 8 months to reach Mars in 1964-1965, but our 21st century Beam Me to Mars messages will arrive at the speed of light — just 15 minutes after they are sent! Beam Me to Mars is the first opportunity for the people of Earth to radio personal messages and pictures to Mars. Although no one is living on Mars yet to receive the Beam Me messages, here on Earth people will hear the messages loud and clear: All Beam Me messages will be delivered by hand to Congress, to NASA, and to the United Nations. Moreover, the entire Beam Me message archive is searchable for free from Uwingu’s web site, and all the messages can be freely shared with friends, relatives, or anyone on social networks. As with all Uwingu projects, half the proceeds fuel grants that Uwingu makes to further space research, education, and exploration; the other half fuels new Uwingu projects.